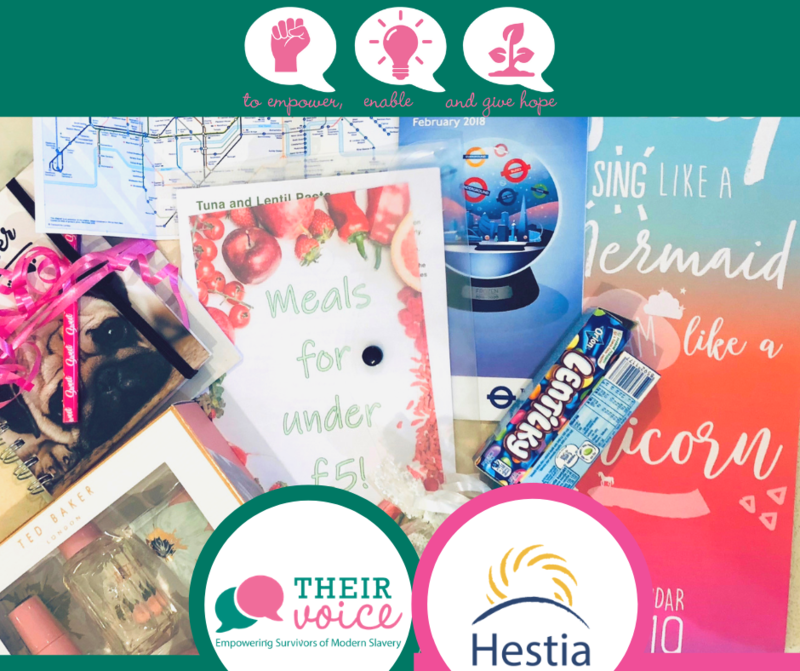 We are delighted to start 2019 by working in partnership with Hestia Charity as they launch a project to provide long term support to victims of Modern Slavery. We were asked to create a welcome bag which provided useful items for each individual recipient as they begin to rebuild their lives in their new community. Each pack includes a small selection of toiletries, an information pack for the area, along with maps of train links, a 2019 diary, notepad and pen, recipes and chocolates. 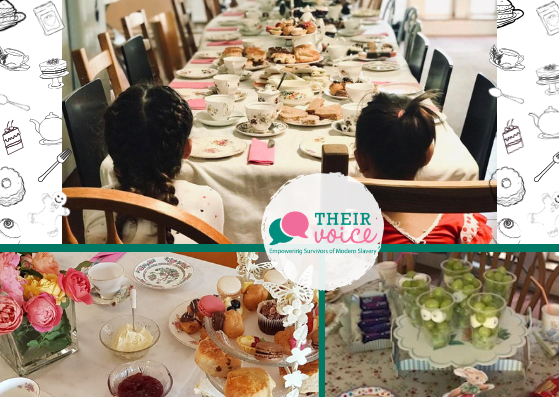 Back in November we had a fun afternoon putting on a traditional English afternoon tea for the women at a safe house. We wanted the women to feel valued so every effort was made over the detail, we wanted to show that we cared by making a positive memory for them. We couldn’t help but notice how they enjoyed the scones. 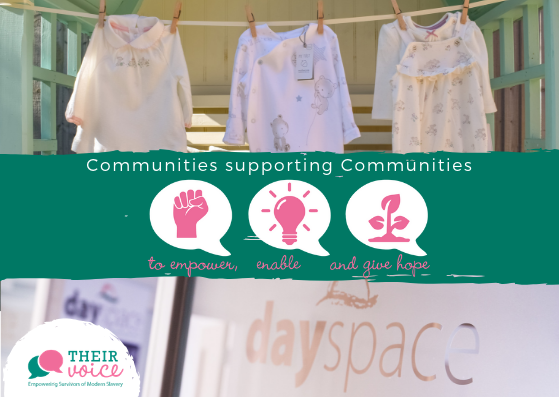 We are delighted to have partnered with an organisation called Dayspace, who professionally support people with a learning disability. Once a month, a group of amazing men and women from the self-advocacy sessions are helping to sort through our donations and prepare them in order to create beautiful presented clothes packs. Learning new skills and offering a feeling of self-worth, one client said, ‘I like to help others, it makes me feel happy’. Continuing to support community participation which empowers, enables and gives hope to others embodies the ethos at 'Their Voice'. 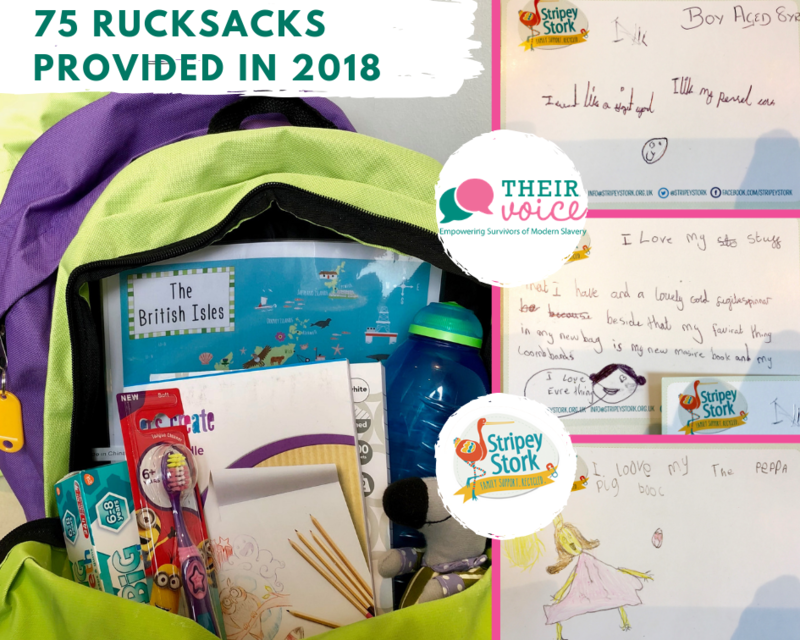 In March 2018 we worked with Stripey Stork to create these educational rucksacks which are given to children aged between 3-12 years old who have been affected by #ModernSlavery. At ‘Their Voice’ we believe that every child has the right to a positive and equal start in life. Each rucksack contains some basic equipment for school, a few toys and treats to bring a smile to their faces. In 2018 we provided 75 of these rucksacks to children and received some lovely responses. Surrey Police announced an addition to their force; a Modern Slavery Victim navigator. This is just one piece of evidence in a long list that demonstrates the breadth of the problem we have with slavery and exploitation in Surrey. Modern Slavery not only exists in the big cities of London, Birmingham and Bristol but in small local communities. A common misconception associates trafficking with immigration and foreigners, but UK nationals are not immune and are the biggest victim group exploited in the UK. In the past year Surrey Police have conducted operations in small, Surrey communities including Woking, Elmbridge and Clacket Lane. One of the major contributors to slavery and trafficking in Surrey are what the police refer to as County Lines. 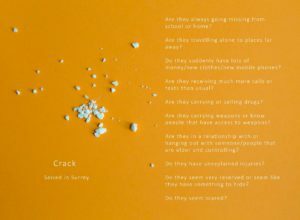 These are urban gangs who recruit, exploit and traffic children into carrying drugs and money into provincial areas of the UK. These gangs often target children who are lonely, vulnerable, excluded at school, homeless of in care facilities. At Their Voice, we want to raise awareness of the problem that Slavery poses especially in Surrey and Croydon. Help us to tackle this problem head on!